Stocks and bonds struggled to deliver positive returns across the board in 2018 - with only emerging market bonds in positive territory. Uncorrelated, defensive investments that are able to pay attractive yields look few and far between. And so, with stock markets tumbling, bonds looking unpredictable and many safe havens being questioned, alternative assets are becoming more popular - one viable option being infrastructure funds. According to a study of 200 financial intermediaries carried out by investment manager Foresight Group, almost two-thirds expect to increase clients’ allocation to such funds, up from one-third last year. Three-quarters, meanwhile, expect to recommend more infrastructure funds to investors. As advisers look to de-risk, they are becoming increasingly attracted to assets that can deliver low correlation to equity markets, low volatility and defensive properties. “High-quality infrastructure and renewable assets can deliver predictable income with low volatility, uncorrelated to traditional asset classes,” explains Mark Brennan, manager of the FP Foresight UK Infrastructure Income fund. Infrastructure is also a hedge against rising inflation, with many companies in the sector having inflation-linked cashflows, meaning returns and income should hold up well in inflationary environments. They also deliver high and rising dividends, with many funds and trusts in the universe yielding around or above 5% and more over 3%. “We think infrastructure can deliver growing income and steady asset valuations throughout cycles,” says Will Argent, manager of the Gravis Infrastructure Income fund. In the UK, Brexit is a concern as it will hit market sentiment and, in turn, share prices. However, Argent does not expect it to have an impact on the fundamental attractions of infrastructure. “If there’s a no-deal Brexit, does it mean that the UK Government is going to start failing to honour its commitment to renewable energy assets, to the healthcare sector, even to the PFI space? No, I don’t think so. The infrastructure market has undergone a big transformation in recent years, with a move towards renewable and more sustainable projects advancing. This is where Argent sees the opportunities in the long-term and has had a large exposure to the space ever since the fund was launched three years ago. Projects get boosts from Government subsidy payments, which generally account for two-thirds of most revenues, which tend to be linked to inflation. With political risks in the UK rising, Argent sees this as largely insulated from that. “Regardless of which Government is in place, that green agenda we feel will be left alone,” he explains. One area that hasn’t benefitted from these subsidies for a couple of years now is the UK solar energy market, which has been bolstered by a transition away from fossil fuels to a low carbon energy market in the past five years. The UK had one of the largest solar markets in the world as recently as 2017, says James Armstrong, managing partner of Bluefield Partners. But the subsidy regime stopped in 2017 and we have seen little to no new solar assets built here since. That might be about to change, Armstrong explains, due to ongoing reductions in the cost of solar infrastructure. 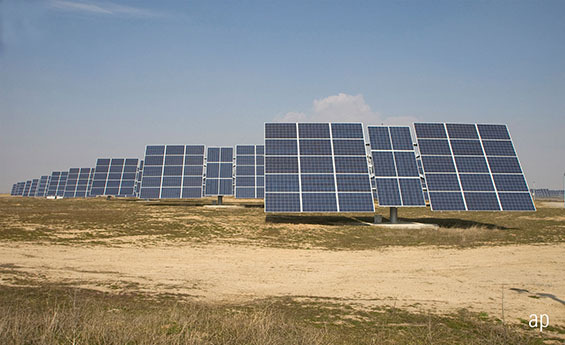 As a result, solar photovoltaic systems are becoming viable without subsidy in the UK. Blulefield Solar Income (BSIF), the fund Bluefield Partners runs, is held in the top 10 of the Gravis offering, but Argent has been taking profits recently and expects to continue doing so. “It’s a great company with good assets and very well run, but everything has a price and the valuation has run away from my point of view,” he says. He’s rotated some of that cash into the NextEnergy Solar (NESF). A new area Harry Seekings, co-head of infrastructure at InfraRed Capital Partners, which manages HICL Infrastructure (HICL), has recently invested in is offshore transmission cables. These cables connect offshore wind farms to the UK national grid and are long-term assets. Like renewable energy, healthcare investment also has political support, with Prime Minister Theresa May this week having outlined a 10-year plan for the NHS. “That’s a space we’re happy to be in – attractive yields, rental growth and very stable asset values”, says Argent. Within that, greater provision of care for mental health could throw up some interesting opportunities including more specialised facilities being commissioned. Gravis holds Medicx (MXF), which invests mainly in primary healthcare properties around the country, and Target Healthcare REIT (THRL), which has a portfolio of care homes. However, some areas of infrastructure are more controversial. One sub-sector that has been used as a “political football”, within the past year - particularly since Carillion’s collapse - is Private Finance Initiatives, or PFI. In the last Budget, Chancellor Philip Hammond said he would allow current PFI projects to run, but will no longer award them. Labour has taken a tougher stance and has advocated scrapping current projects, though that has moderated somewhat recently. “An incoming Corbyn Government is a threat to PFI,” says Argent, who is underweight PFI due to a combination of overhanging political risk and relatively unattractive-looking returns. Around 70% of HICL’s portfolio is invested in public-private partnerships, which makes it particularly vulnerable to sentiment towards PFIs. But Seekings notes they equity investors typically have the right to receive compensation at market value if the public sector voluntarily terminates a PFI contract, saying "There are provisions there that protect the private sector by compensating at the value of its investment. He also points out that not all of HICL’s PPP portfolio is situated in Europe and that the company's diversification builds in resilience to mitigate that. The story is not just a domestic one either. “Exposure to infrastructure is important going forward into a more challenging economic outlook,” says Thomas Rosser, junior analyst at The Share Centre. First State Global Listed Infrastructure is noted by both Rosser and Adrian Lowcock, head of personal investing at Willis Owen, as a fund to buy for 2019. It invests in companies listed in developed markets involved in various areas of infrastructure, including energy, communications and transport. “This fund performs best in relative terms in declining markets due to the economic insensitivity of the underlying holdings and the attractive yields on offer,” says Rosser. The fund is also rated Bronze by Morningstar analyst Fatima Khizou, who says it displays "an appealing offering of insight and dependability". A similar fund is M&G Global Listed Infrastructure, which Gill Hutchison, research director at The Adviser Centre, also likes. "I don’t think there’s any real reason to think that our exposure to our underlying companies are particularly exposed to the changes that will occur."